University of Maryland Upper Chesapeake Health (UM UCH) has elected Bryan E. Kelly, CFP®, chair of the board. James M. Harkins has been elected vice-chair; Franklin J. Hajek, CPA, treasurer; and Richard P. Streett, Jr. V.M.D., secretary. They will serve two-year terms. 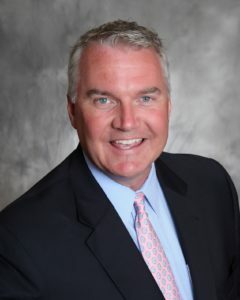 Kelly is a Certified Financial Planner™ and founding partner of The Kelly Group, a Bel Air-based firm that provides financial planning, wealth management and asset management services. He serves on the board of directors for Harford Bank and the PIMCO Independent Advisory Council. He is past chair and vice chair of Harford Community College; a past board member of the Harford Community College Foundation and past chair of the Academy of Finance. He also served on the Financial Planning Association of Maryland and served as past co-chair of the University of Maryland Baltimore County (UMBC) Economics Advisory Council and past president and treasurer of the Maryland Association of Community Colleges. A Darlington resident, Kelly has been involved with University of Maryland Upper Chesapeake Health for several years. He was appointed to the UM UCH, Hospital, Venture and UCH Foundation boards in 2013. He has served as treasurer of UM UCH and its hospitals’ boards of directors and chair of the Finance Committee. He is a former member of the University of Maryland Medical System’s Financial Affairs Committee. To read the rest of the article click here.